» home » magazine » 2012 » november 2012 » why should you converse with your stampings? Friends bring an unconscious patient into the emergency room. The ER doctor examines the patient and finds no cuts, broken bones, bleeding or other visual external injuries. Does the doctor send the unconscious patient home because no treatment is obvious? No—instead, he conducts batteries of tests on the patient, in effect asking the body of the unconscious patient a series of questions, to which the body responds with data. This data provides exact information about the body’s condition. The success of this “conversation” depends on the doctor asking the right questions, and having the equipment to decipher the answers. Often the problem does not lie with one single body function; rather it results from the interaction of several functions. Fig. 1—Stamping has two areas with identical final strain distributions. Segue into the pressroom, where a new tool has made its first hit. Behold, the resulting stamping displays no tears, strain gradients, excess springback, faulty dimensions or class A visual defects. Does the tool and die person release the stamping for production? All too often the answer is “yes,” because job one rapidly approaches. However, this is the perfect time to hold a “conversation” with the stamping. What questions to ask? While no tears are observed, one might ask if the stamping deformed into the yellow (danger) zone of the forming-limit diagram, where sporadic breakage is expected. 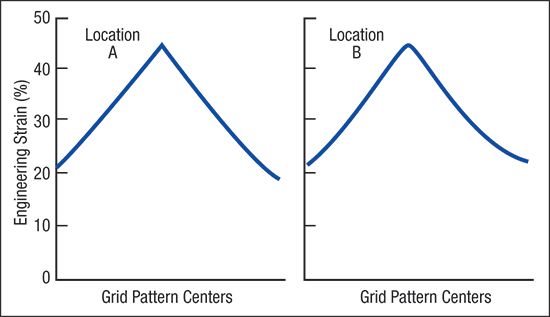 To collect the relevant data, we use circle-gridded blanks or other surface-strain measurement techniques. We might also look for steep strain gradients with highly localized thinning, which can cause major changes in elastic stresses and result in springback and dimensional changes. An ultrasonic thickness gauge can extract the required data from the stamping. Fig. 2—Two locations on the same stamping with identical final strain distributions exhibit widely different strain histories. Are temperatures increasing in areas of severe deformation and causing a change in the effectiveness of the lubricant? We can track these temperature changes easily, for the die and the stamping, with a laser thermometer gun. Looking at the total forming system, more than 50 inputs can affect the final characteristics of a stamped part. Most of these inputs interact with each other. Attempting to measure every input and gauge all of their interactions proves nearly impossible. Hence, we focus our “conversation” on the output of the system—the stamping. • Where are your hot spots? • Do you like the properties of the specified material? • If I change this blank contour, are you more comfortable? • Are you exactly like the virtual stamping? • Where are you different? • Why are you different? Consider this case study illustrating how a conversation with the stamping can solve a random breakage problem. Under investigation: two locations on the punch, A and B, 3 ft. apart. The two strain distributions, measured at full depth or home stamping, are nearly identical (Fig. 1). Location A appears stable and never fails, while location B experiences frequent breakage. The available data proves insufficient for identifying the problem, or a solution. Fig. 3—Strain history for Location A was uniformly controlled by a draw bead. Location B started with the blank freely sliding into the die. It then formed a buckle at 6 in. 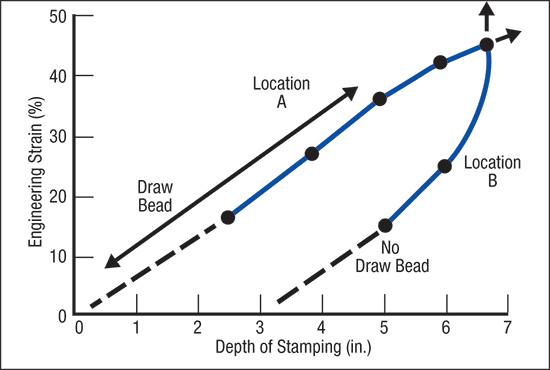 of stamping depth that greatly changed the final strain history. 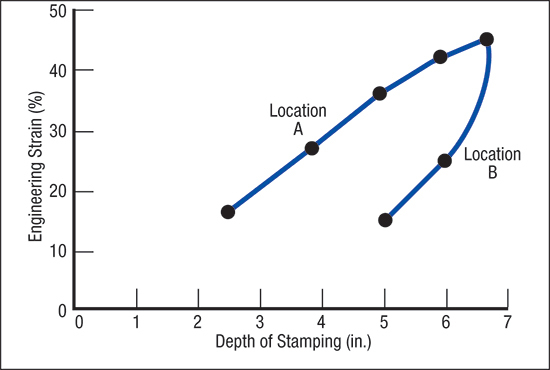 Step one is to identify the strain history by asking the stamping for a series of incremental hits or breakdown stampings (Fig. 2). Location A appears to have a constant rate of straining until the very end of the stroke, where the rate of straining decreases. Location B exhibits the opposite behavior, as forming begins later in the stroke and then increases its rate of straining as the stroke approaches home depth. Next we extend both strain histories back to their starting points (Fig. 3). Location A begins straining as soon as the punch contacts the blank, with a constant rate of deformation. Approaching home depth, the geometry almost is complete and strain rate tapers to zero. In the blankholder we find a draw bead exerting a restraining force and creating constant blank movement into the die opening.